Tuckaway has Ocean and Point Lobos views & is pet friendly ! Overlooking green fields adjacent to the 18th century Carmel Mission and a beach beyond 'Tuckaway' studio features more than captivating views. Behind a garden gate, through your private entrance is a bright quiet cozy retreat. This spotless eco-friendly studio has a comfy Queen Bed with Luxury Linens, filtered water, and is cleaned with organic products. Newly remodeled Tuckaway's hand-hewn hickory floors and oriental carpets are just some of the examples of our attention to detail.New Granite counters in kitchen & bath with all new fixtures & stone floor in bath. Come and be enchanted in the landscaped gardens with covered sitting bench that are very private. The gardens include a lit fountain, Over 1,200 sq. 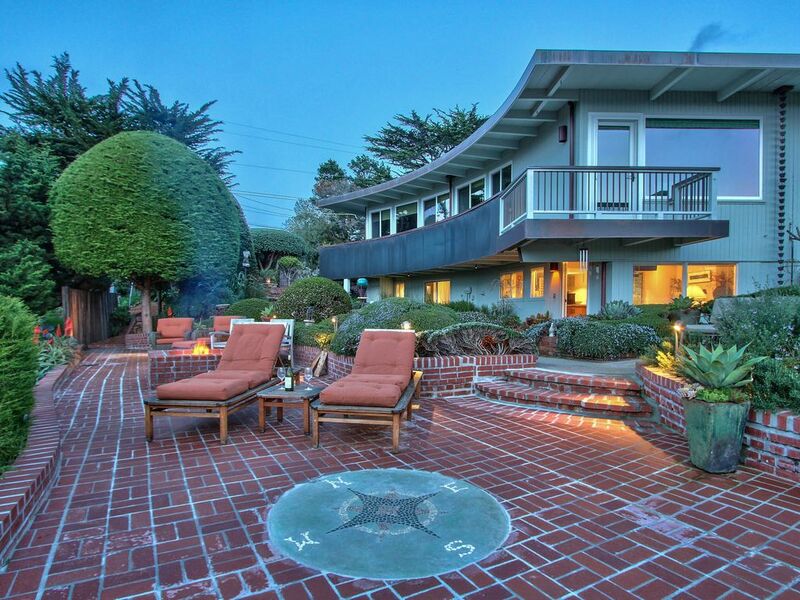 ft. of Custom Inlaid Brick Patio with Ocean & Beach Views. Custom Wood/Gas Raised Brick Fire pit, Teak Lounges and a settee to enjoy in the sun or evenings with native plants and well placed low voltage lighting casting a special glow. Fenced in private yard for you and your pet! I have lived in Carmel for the past 30 + years, and have been selling Real Estate on the Monterey Penn.the entire time. I have a degree in Landscape & Design and have created all of the design and plant selection that has made the 'Tuckaway'that special,Private & Romantic Getaway that it is. If after you have visited us,and should decide to look into living here in Carmel or any of the surrounding areas, I would be happy to show you the many beautiful places that are available to see.I have represented many Buyers as well as sellers and enjoy helping people realize there Dream of owning a special place on this Beautiful Monterey Penninsula. I created the 'Tuckaway'the Gem of Carmel, because I wanted to offer a Special, Private,Clean & Romantic place where people could come and Relax and truly feel like they were getting away from it all. The Hardwood floors are of hand scraped Hickory Pecan & Walnut with oriental rugs,all new cabinets & light fixtures as well as a stacked Mieie Washer & Dryer.There is an Ocean view Custom Inlaid Brick Patio area with Teak coushion Chaise Lounges as well as a Brick Gas/Wood burning fire Pit! There is also a designated off street parking space for the 'Tuckaway' All of this and close to Downtown Carmel-By-The-Sea! At the 'Tuckaway' you are within walking distance to the 'Carmel Mission Trail Park' that is a walking trail to downtown Carmel with plenty of Shops and Restaurants as well as the Beautiful sandy beachs of Carmel-By-The-Sea.It is only a few minutes drive to the Beautiful State Park known as 'Point Lobos'located right on the Pacific Ocean !There are numerous Wine tasting rooms as well as Vineyards within a short drive, as well as the Finest Golf Courses in the Country.Just 10 minutes away is the Well known Monterey Fishermans Wharf and Stienbeck Cannery Row with many gift shops & restaurants! Great views of the Odello Ranch & Point Lobos Reserve as well as the Mountains & hills of the Santa Lucia preserve. (3) DVDS Available to watch Free of charge! Great space in an amazing location. Even the rain couldn't ruin our recent getaway to Bill's wonderful place. While we didn't get to enjoy the patio with ocean views, the cottage is stocked with everything you need to enjoy your time in Carmel. Highly recommend a visit to the Tuckaway. We originally rented one of his other properties, and it happened to be too small for our liking, luckily for us he had an opening at another property just down a walkwaY, it was a perfect fit. Waking up to a beautiful view with the ocean in the distance and having a clean, organized place made this stay worth while! Thoroughly enjoyed the stay! Bill was really great to work with and gave us a lot of great tips on local things to do when we arrived. The Tuckaway was very clean and the back yard is beautiful with lots of places to sit and relax. For those wanting to cook while they are at the Tuckaway, please note the oven is very small but can comfortably fit one normal sized disposable roaster pan. We very much enjoyed our stay at Tuckaway. Bill was very welcoming when we arrived. We felt like this was a private oasis! Bill and Katherine have a wonderful place for the perfect getaway visit to Carmel. Beautifully manicured landscaping and relaxing atmosphere. Convenient to shopping and exploring. We enjoyed our experience at the Tuckaway and look forward to a future visit. We very much enjoyed our stay at Tuckaway. The unit is private, clean and absolutely beautiful. Bill was a great host.